This darling family is dreaming merrily about the joy that awaits their waking! 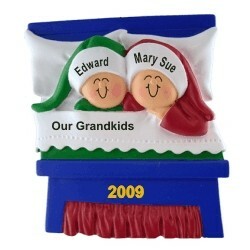 The Christmas morning family of 3 personalized Christmas ornament will brighten smiles as well as holiday displays this and every year. Our lettering pros handwrite onto these family ornaments personalized from Russell Rhodes the details you provide, including each person's name on the cap. Displaying the family of 3 Christmas morning ornament personalized to be one of a kind is easy with the included cording, and the decoration arrives in our custom velvet drawstring pouch.